Cost to hire a plumber varies greatly by region (and even by zip code). Gert free estimates from plumbers in your city. Are you sure you want to leave? Your ansvers will be lost. We rounded up all the costs associated to basement waterproofing. Browse our basement waterproofing cost guide for more details. Basements are parts of a building that are located completely or partially below the ground level and are most of the time used as storage facilities. These premises are the most universal in your house as they can be designed and equipped to serve various other needs. You wonder where to place your fitness equipment? The basement. You want to design a little entertaining area with a sound system, a game console and a 50” TV, where you can chill? Do it in the basement. You want to have enough space and privacy to work on your side project? Go try the basement. Basements are suitable for everything. Except being the universal premise in your house, your basement serves another very important need – to ensure the structural stability of the whole building. The most important parts of the foundations (the walls and the floor) are laid in the ground and are an important part of your basement. That is why the careful construction of the basement is vital for the comfortable future exploitation of your whole home. “To start from the basis” is an expression that is widely spread and used for different purposes, but it’s roots are in the construction industry. The meaning of it is that the most important thing you have to do, if you want to achieve or learn something is to progress gradually, starting from the foundations. It is just the same when it comes to building a house – a stable home with guaranteed long-term exploitation quality requires carefully constructed basement (foundations). But what are the risks that may affect the structural stability of your basement, therefore your whole home? The fact that the basement is located under the ground level, makes it vulnerable to many different aggressors, such as the huge side pressure from the surrounding ground which often leads to significant movement and settling of the foundations. But the main problem that usually harms the stability and comfortable exploitation of a basement is water and moisture penetration. Such issues will cause many negative consequences, such as mold and mildew formation and their spreading across other premises in your home; weakened strength of concrete and other materials, laid in the foundations; significantly reduced exploitation quality, such as bad smell, color spots and etc. What many people underestimate when they are building their homes is the importance of waterproofing, especially when it comes to the basement. The reasons for that are numerous – from the fact that the builder didn’t take it as a primary focus or considered it as important as it is, to his aim to cut corners and finish with all the work in accordance with the initially-set project’s deadline and etc. Most of the time you will not be responsible for a mistake like this, but you will later on suffer its consequences. Waterproofing is the process of applying specially designed systems and materials which form a seamless moisture-prone shield. The main aim of this process is to keep the water and the moisture outside of the living premises, which will ensure their functionality and comfortable exploitation conditions. There are basically two main types of waterproofing techniques – interior and exterior. Both of them have their pros and cons in terms of effectiveness, cost, application and etc. Although waterproofing should be the mandatory, number one goal of every homeowner, it is often being left out of the “to-do list”. This is the main reason why many of them will later on wonder why they have to spend so much money on repair works. Usually, a homeowner starts thinking about waterproofing only when there is a problem, which is definitely not the right thing to do. Waterproofing is prevention and prevention is trouble-free exploitation. And the most relevant example for this is the basement in your home. A basement needs to be effectively waterproofed because of the fact that it is located partially or completely under the ground and is significantly exposed to the retained water in the soil from rains, irrigation and etc. A missing or damaged hydro insulation will result into moisture penetration and further significant problems, such as its vertical movement and spreading across different structural components, resulting into formation of mold and mildew. The capillary moisture and its movement may result in many other problems with the surrounding premises such as efflorescence, weakened stability of paints, plasters and other finishes, detachments and significantly harmed overall functionality. When you think about basement waterproofing, consider it as equally important as ensuring the stability of the foundations of your home. If the insulation layer in your basement is either damaged, or totally missing, in the long run, you should expect many additional repair works and unnecessary renovation investments. And we are not talking only about applying new paint because of the mold and stains formation. We are talking about enhancement of systemically important components in the basis of your house. For example, if your basement lacks adequate waterproofing, the water and moisture from the soil will then penetrate the concrete in the foundations and when the temperature drops significantly (depending on the characteristics of the region where you live), they may freeze in the pores of the material. The freezing moisture will then increase in size and cause additional pressure on the concrete. In the long term a process of constant freezing and defrosting of moisture, due to the temperature fluctuations will result in significant weakening of the concrete, cracks and overall instability. All that makes the application of suitable waterproofing materials, which will ensure the resistance of all structural components to negative water pressure, extremely necessary for the long-term comfort of your home. Remember that the waterproofing of the basement is not only important for the overall stability and functionality of your home, but for its aesthetic appearance and healthy exploitation too. When it comes to the waterproofing materials, there area wide range of options that professionals prefer to work with. Maybe you have heard about the most-popular and widely-spread waterproofing material – the bitumen. In fact, this is one of the most effective water barriers that are used in the construction industry. But when you hire a professional to handle the insulation of your basement, he will most probably use other types of waterproofing materials which are more suitable for the specifications of the project. Concrete coatings, for example, are very common waterproofing solutions because of their easy appliance, durability, elasticity and long-term protective qualities. Their ability to form a seamless hydro insulation membrane, resistant to positive and negative water pressure, has proved them as a very popular solution for waterproofing of various kinds of premises and construction elements. Most of these materials are cement-based and very much resemble tile adhesives. They are applied with brushes, rollers or trowels on 2 to 4 layers, depending on the specification of the project. The price of such products may vary widely, depending on their quality, the producer, the specifications of the product and most importantly – whether you are buying only single or double component product. Double component products contain a dry part (the powder) and a liquid part which should be mixed. There are some low-to-medium budget single-component solutions which require the dry part to be mixed with water which will cost you in the range of $30 to $40 per 100 sq. ft. on average. The double component products are more expensive as they are priced in the range of $50 to $70 per 100 sq. ft. There are also some silicate-based sealers that ensure very good adhesion to the concrete and will bond to the surface not only physically, but chemically too. That way, these products are able to form a very durable, long-lasting waterproofed film. Such products are cheaper and will cost you in the range of $40 – $50 per 200 sq. ft. If you have heard the term “waterproof paint” and wonder whether this will help you protect your basement against moisture, then you should know that the answer is: definitely not. A paint itself, no matter if it is “waterproof” or whatever other marketable name it is, cannot insulate your home. The so called paints are suitable for wet premises, such as bathrooms, basements or for kitchens with high concentration of vapor (generated when you cook), but they can only withstand the formation of mold and mildew. Or in other words – these paints are effective only against condensation moisture. The finish, that such products form, cannot withstand aggressive water pressure for the long-term. But if you decide to decorate your basement in a specific color nuance, then these paints are your best choice. Nevertheless, you should consider them only as an addition to the main waterproofing materials, such as cement-based slurries, sealants and etc. If you decide to invest in waterproof paints, then you should be aware that they may cost anywhere in the range of $20 to $150 per can. In addition, a professional painter will charge you in the range of $0.5 to $1.5 per sq. ft. Nothing can replace the guaranteed effect of a good waterproofing when it comes to the prevention of your basement from the negative effect of water and moisture. Yet there are some useful additional steps that may significantly ease the pressure that your house will need to resist in order to remain unharmed by the effect of water and moisture. One of the most important things to consider when constructing your house (or to check for it when buying a new one), is the grading. Good grading means that the slope of the ground around the foundations of the home allows the rain water and the melting snow to flow away from it. A popular example of a good grading is the ditch around the house which many builders create in order to route the water to the street or the back yard. A positive grading is the easiest way to add additional protection for your home and your basement in particular, when it comes to dealing with a stubborn aggressor like the water. The ever-increasing levels and intensity of rains in the recent years is a significant obstacle for the stability and exploitation quality of our homes. A not so popular, but a very effective addition to the set of protective tools for your home are the gutters and the downspouts. Many people do not pay significant attention to their design and functionality, but this is very important for handling the water pressure from continuous rains and storms. Nowadays, there are various kinds of options on the market, but your best choice will be a continuous gutter and wide downspout which will be able to effectively drain the water away from the foundation and the basement of your house. 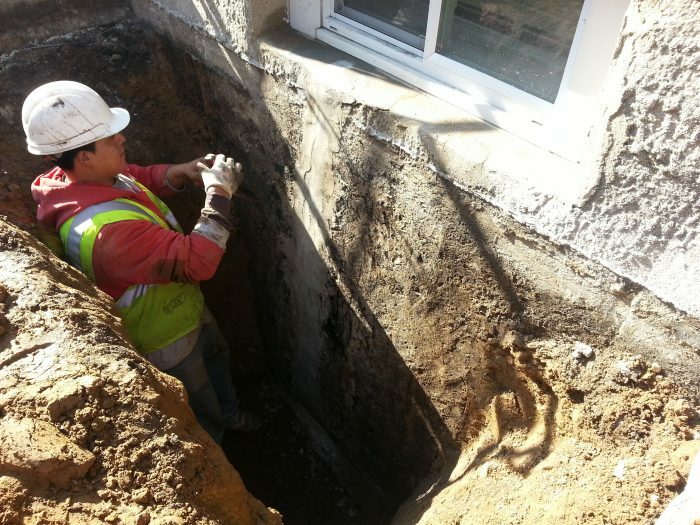 No matter how stable and durable the materials in your foundations and basement are, after many years of effective service, they may be compromised. In the long-term, the formation of cracks is something normal and you should not be concerned about the stability and exploitation quality of your home. Just bear in mind to fix them in time. A basic rule of thumb is that whenever a crack in your basement appears, there is high probability that in some future moment, it may become a source of leakage or moisture penetration. That is why, whenever you see a crack, you should repair it. Basement waterproofing is a complex task that requires hiring an experienced professional who will be able to handle the process smoothly and will guarantee the long term quality of the waterproofed areas. Bear in mind that trying to execute the waterproofing work all by yourself, will most probably result in a complete failure, if you have no previous experience. The application of waterproofing materials is a little bit more complex and you better not risk doing it yourself. When it comes to waterproofing of your basement, the most important thing that you have to do is to make a good research and to find a trusted and experienced professional. A useful thing to do is to stick only to contractors that belong to the Basement Health Association – an organization, specialized in certification and education of highly-specialized professionals. That way, you will be quite sure that the one you have hired will handle the working process effectively and will guarantee you long-term quality, in compliance with all industry requirements. Most of the companies in the basement waterproofing niche will provide you with an exploitation guarantee. Depending on the specifications of the premise, the type of the waterproofing work that has been done and the applied waterproofing systems and materials, the guarantee may vary from 10 to 25 years. Another useful thing to do is to look only for companies that are licensed and insured accordingly. That way, you will be confident that if at some stage, your warranty terms are triggered, you will be treated professionally (make sure to make an initial inquiry about the terms and conditions of the warranty – how long is it, what does it cover and so on and so forth). Last but not least – trust the professional you have hired. He is the one who will be able to correctly identify the exact problem (if there is such), the specifications of your project and the most appropriate set of materials for the successful insulation of the premise. Do not cut corners on labor cost and its quality. That is something that may determine the long-term quality of the basement waterproofing. 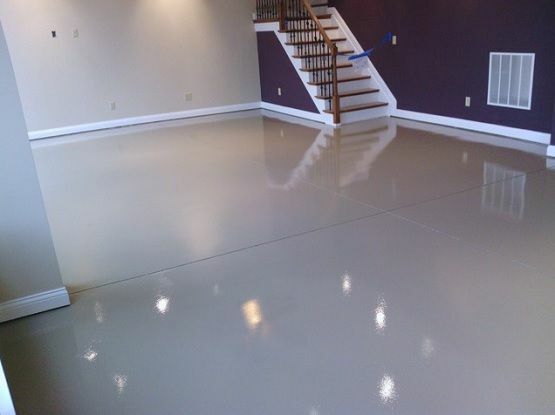 When it comes to calculating the cost of labor for your basement waterproofing project, it is important to notice that depending on the company and its business model, you may be charged per linear foot or a fixed sum for the whole project. Nevertheless, you should expect to pay in the range of $5 to $15 per sq. ft. This sum includes all materials, installation of drainage components, repairing and waterproofing work. Estimating the exact budget for your basement waterproofing project can be a tough task, because of the fact that there are many specific details and possible working scenarios for handling the insulation process of your basement, depending on its condition and characteristics. It is very important to understand that the moisture protection of your basement should be considered as an investment, not as expenditure, the results from which can’t be visualized, like when you paint your room, buy a new sofa, change your windows and etc. In fact, the Return On Investment (ROI) of a basement waterproofing project is estimated to be about 30% which proves their economic efficiency. So, the average cost for waterproofing a basement of approximately 1200 sq. ft. is estimated to vary in the range of $3 000 to $6 000 with a national average of $4 000. The price includes labor – a professional, licensed contractor and the needed waterproofing materials, as well as some additional work such as cleaning of gutters and downspouts, repairing of small wall and floor defects and etc. Bear in mind that if there are significant cracks on the floor of the basement, you will be charged approximately $500 – $700 per 20 sq. ft. The cracks will most probably be fixed with an epoxy injection which will cure in no more than 5 hours. If there are cracks in the cove joints (the areas where the floor meets the walls), you will need to set aside some extra $300. 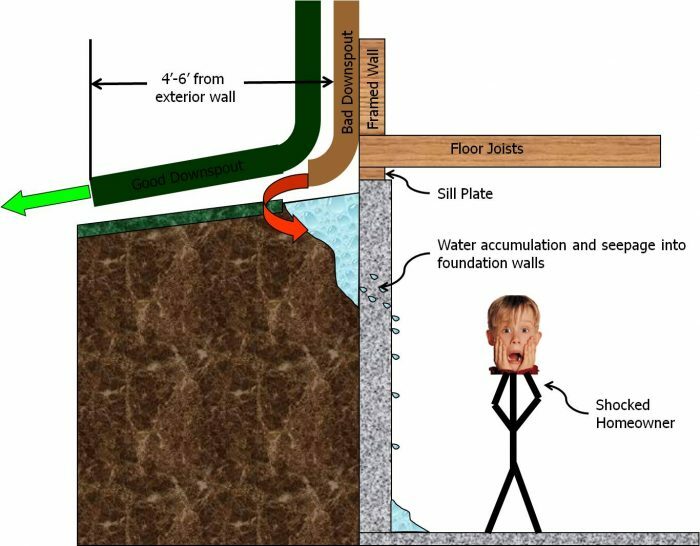 To conclude – if you are about to waterproof your basement and its foundations are stable, without any visible cracks or loosened concrete, you should expect to pay $4 000 on average. Bear in mind that this is the price for interior waterproofing. When it comes to exterior works, then the required budget rises significantly because of the harder and more complex work that should be handled. Remember that there is no universal solution to the basement waterproofing case. Every project has its own individual characteristics – from the climate, the type of your home and its architectural specifications, to the terrain and the soil around it. These are all factors that can affect the choice of waterproofing technology and materials, therefore – your budget. First of all – don’t panic! The sum that was calculated above indicates the average budget that your basement waterproofing may require you to set aside and your project will most probably fit this range. The following things are just additions – you may or you may not need to spend on them. Analyzing the other factors that you may need to consider will provide you with further clarification on what to expect when planning your project, in case some additional work is required. Bear in mind that when it comes to budget estimation, it is always better to be prepared for the “worst case scenario”. So, depending on the specifications of your project, there may be these cases when the ground around your house is not shaped with the required slope and you may then experience the need to remove a given amount of soil, so that the water can easily flow away from the foundations of the house. If you face such problem, you should set aside approximately $100 to $300 for every 5 yards of soil that needs to be removed, depending on its type and the location of your house. If you need to improve the gutters and extend the downspouts of your house, which in fact is very important for the way the building handles the heavy rainfalls, you should be ready to spend anywhere in the range of $200 to $2 000, depending on the type of products that you choose, their length and other similar specifications. Having to deal with the very common problem of condensation moisture in your basement, usually requires investing in dehumidifier. If you have a small basement or a not-so-humid one, you can buy a cheaper option for $150 to $350. On the other hand – if your basement is bigger or has very high level of dampness, you may need to buy a more expensive one which may cost you as much as $700 – $1 400. A more complex task, such as the installation of a drainage system in your home starts from $1 000 and can go up to $10 000 if your project needs some French drains and other components too. That kind of equipment works through a trench in the foundation of your basement. There you will have a sump pump installed that will drain the water out of your house. Some of these systems have additional features such as vapor barriers, in order to ensure a very effective shield against condensation. Bear in mind that such project is way more expensive, but it will provide you with an effective system for handling massive amounts of water for the long term. For the installation of such drainage system, you will need to hire a professional plumber, who will charge you in the range of $45 to $65 per hour. Consider the fact that this is a tough task and the plumber may need more than 10 hours to complete it. 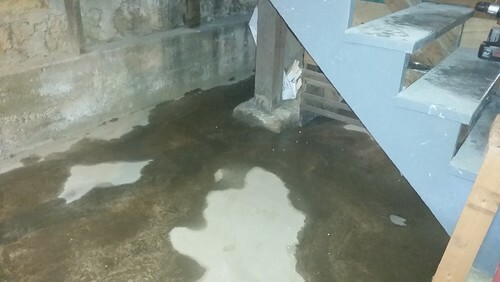 If you are in the unpleasant situation when your basement is flooded due to heavy rains, leaking pipes or other similar problems and you need to fix the damage, then the budget that you will need to set aside depends on the type of the water (whether it is clean, grey or black) the size of the premise, its accessibility and etc. On average, repairing water damage will cost you in the range of $3 to $7 per sq. ft. If you are confused and don’t know what is the best solution for your project, you may need to hire a professional home inspector. In fact, this will be a very good move, because for as less as $150 – $250, you will receive professional advice about the most appropriate system or set of materials that should be applied, so that your basement can become completely moisture- and water-resistant. Because of the fact that there are many different things which should be considered when starting a basement waterproofing project, the insulation work can sometimes be tricky. Although such complicated process requires professional assistance, there are some useful advices that you can take into consideration when you are planning the waterproofing of your basement. On your first and most important step. The rule of thumb when it comes to waterproofing is: first find the source, then fix the problem. Many people take the unnecessary step to waterproof their interior walls or buy a dehumidifier or even replace the gutters and downspouts when in the end, the problem appears to be just a leaking water pipe which may cost you no more than $50 to be replaced. Especially when it comes to moisture-connected issues, the hardest task is to locate the source of the problem. And this is the most important part of the process as well. Fixing it is an easy task, compared to its localization. If you wonder how hard is it to find the source of the leakage, bear in mind that even modern technologies such as thermal imaging cameras can’t guarantee you 80% success rate (of course there are some high-end products that can localize the problem easily, but to hire a professional who has such kind of equipment, you should set aside a significant budget). So if you have any moisture-connected problem with your basement, before starting to spend on waterproofing materials, make sure to consult a professional in order to be confident about its type and the best wait to tackle it. On the best choice. The best choice when it comes to whatever kind of waterproofing project it is, will always be the exterior insulation. It is the same with the walls of your basement – the best way to tackle the moisture problem is to waterproof the foundations from the outside. That way it won’t be able to penetrate the surface and will stay away from the construction elements. Although interior waterproofing is still a very effective and guaranteed way to get rid of the moisture, it is always better to keep it outside of the construction, instead of between the concrete foundations and the insulation layer. But exterior waterproofing is the most expensive solution on the market as it will cost you anywhere in the range of $10 000 to $20 000 (some projects may cost up to $80 000 based on their location, accessibility and the amount of digging that is required), depending on the project’s specifications. If you wonder why is it so costly, the answer is because of the complicated technological process. The first step requires extensive excavation work all around the walls of the house right to the point where the foundations start. Then comes the installation of waterproofing membranes and drainage system (most of the time panel-based). That way, the water can easily flow down to an exterior drain, placed at the bottom of the basement’s foundations. Everything else is handled, either by the power of gravity or by a specially-designed pumps. Although very effective, the exterior waterproofing may appear an unnecessary luxury for your home. When consulting a professional home advisor, always ask whether interior insulation can solve your problem (most of the time it will). That way you will be able to save significant funds that may be later on invested in some other home-improvement ideas. On how to determine if your basement is at risk. Apart from already obvious problematic issues such as moisture, mold, stains, bad smell, compromised wall finishes and etc., that will immediately force you to waterproof your basement, there aren’t many ways to find out whether the underground premise is at risk. If you do not have the needed budget at your disposal at the given moment and you do not have any information whether the basement is effectively insulated (especially from the exterior), you can do a simple, yet very effective test, to check whether you should act quickly and waterproof your basement. The test requires you to place a little piece of aluminum foil on some of your basement walls and leave it there for about 24 hours. If you check it on the next day and find condensation moisture on the outside of the foil, then this means that there is high humidity in your basement. Such problem is not so serious as you may be able to solve it with the help of a portable dehumidifier. But if there is condensation moisture on the inside of the foil, then you should be warned that the soil around your house is very damp due to underground or rain water, bad drainage slump or etc. That is when you need to call a professional for basement waterproofing. On maintenance. Taking care of the different components of your drainage system is essential for ensuring its long-lasting and effective service. For example, make sure to run a periodical check on the condition of the gutters and the downspouts of your house. Leafs, mud, debris – make sure to remove them as frequently as possible, because they will act as a barrier for the smooth water flow and will most probably make it splash around the house and its foundations. This will cause some unnecessary moisture pressure which can be easily avoided with just a simple effort once or twice a month. Another important thing to bear in mind is the fact that the basis of your house is a zone that is under constant pressure from water, snow, movements, mechanical aggressors and etc. Although this area is very stable and strong, there are often cases when cracks between the ground and the wall of the house may appear. Such problems will most probably result into a basement leakage. That is why you should constantly monitor the condition of these areas. If you notice a crack make sure to fix it as soon as possible, so that you can prevent any further problems. On foundations’ stability. A problem with the foundations of your house will be the last thing you want, because it will cost you a lot of money to be fixed. If you want to know more about the prevention of such issues, you should first of all consider the risks that a foundation is usually exposed to. An important factor to start with is the pressure of groundwater as it is one of the most aggressive and widely spread reasons for problems with the foundation of a house. The constant vibrations and hydraulic movement can lead to cracks and loosened joints which will further expose the floor of the basement (as well as the walls of the foundations) to moisture penetration and structural instability. If you notice that cracks are starting to appear, another thing that may be responsible for that is the movement of the soil around your house and below your basement. Bear in mind that, the more porous a soil is, the more it will move. For example – clay can’t maintain constant moisture levels which makes it expand and shrink when it becomes wet and then dries. Such periodical movement leads to structural shifts of the house which significantly increases the pressure. So, there are two things that you have to do to avoid such problems. The first one is to reinforce the floor of your basement and the walls of the foundations. This is a specific work that requires you to contact a professional home advisor who will inspect the area and inform you about the best solution for ensuring long-term quality and the stability of your house. The next thing is to make sure that the contractors you hire will work only with such products and systems that have high-elasticity qualities. The higher elasticity a product has (for example – the waterproofing slurry that is applied to the floor and the walls of your home), the better its ability to absorb structural vibrations and movements without compromising its finish will be. Of course you cannot rely only on a product elasticity if there are significant shifts, but it is a good place to start and will save you ton of money without noticing a single crack on the applied finish. When you are buying or building your new home, there is a very high probability that you will miss to consider the basement waterproofing as an important part of your plan. The basements of most of the homes that are built in the past are not insulated against water and moisture, which means that there is a very high chance for you to deal with some waterproofing works during the exploitation of your home. Nowadays the materials and the systems that are available on the market are very effective and can guarantee the safe and healthy environment in your living area. Bear in mind that moisture is the “silent killer” of construction materials and if you do not make sure to waterproof the important elements for the structural stability of your basement, therefore your whole home, you will most probably face the need of a very expensive repair work in the next few years. So, if you are not sure whether your basement can effectively withstand the negative effect of underground water and moisture from the soil, pick up the phone and get in touch with a professional consultant. Remember that ensuring the right prevention is always better than fixing the consequences of a problem.